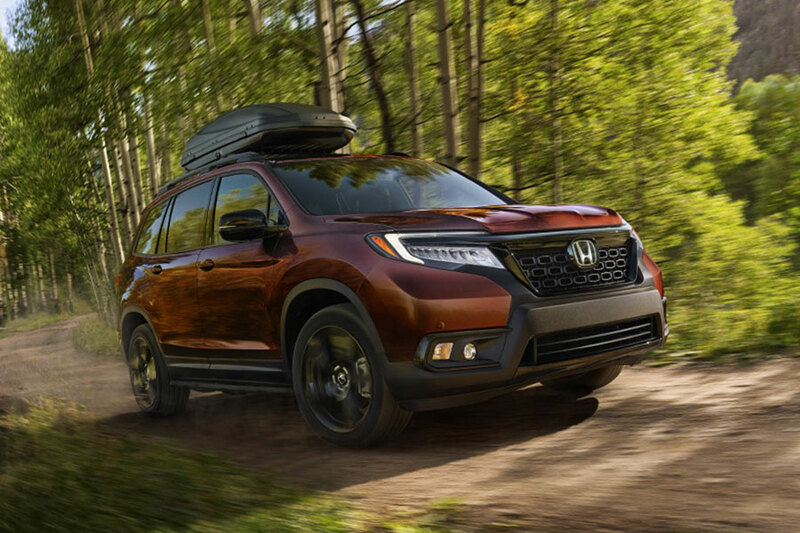 The up-and-coming 2019 Honda Passport is putting an especially rugged spin on your travels.The Passport is a five-passenger SUV for shoppers who feel that the Honda CR-V is too small and the three-row Honda Pilot is too big. It's the Honda equivalent of Goldilocks's "just right!" Technically, the Honda Passport has the same underpinnings as the Pilot, but it lacks the Pilot's third-row seat. But this crossover is more capable than the Pilot - especially when it comes to off-road exploring. Honda fanatics will recognize the Passport's trim lineup: the Sport, EX-L, Touring, and Elite. These crossover models are also loaded with familiar features. Comforts from standard tri-zone automatic climate control to optional leather upholstery add to the Passport's road-trip appeal. And every single model gets the Honda Sensing safety features. These high-tech gadgets alert you to potential crashes and lane drifts. When necessary, they can even hit the brakes or steering you back to the right lane. All but the base Passport comes standard with an 8-inch touchscreen loaded with Apple CarPlay and Android Auto. This means that you can make hands-free calls or check the weather as you cruise down your favorite trail. What are the 2019 Honda Passport engine specs? The Passport will share a powertrain with the Honda Pilot - Honda's trusty 3.5-liter V6 engine and nine-speed automatic transmission. As far as refinement is concerned, this is one of the best pairings around. And, thanks to the Passport's smaller size, the engine's 280 horsepower and 262 pound-feet of torque should make it quick to swing into action. Is the 2019 Honda Passport AWD? Yes! The Passport was designed to deliver rugged adventure, which it does in part with its optional all-wheel-drive capabilities. Besides giving you extra traction in off-road terrain, the Passport also has an extra inch of ground clearance on the Pilot. 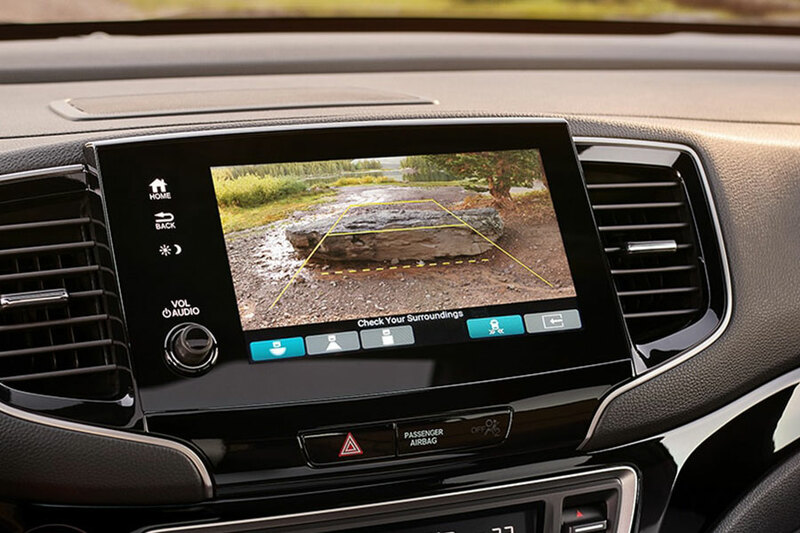 The Passport features way better approach and departure angles, too, helping you navigate rocky terrain without a scratch. All-wheel-drive Passports are also rated to tow more, hauling up to 5,000 pounds. Front-wheel-drive models max out at 3,500 pounds. How much is a 2019 Honda Passport? The Honda Passport begins at $31,990 for the Sport trim, which features a V-6 engine and Honda's array of safety features as well as convenience features like remote engine start (great for cold winter mornings! ), smart entry, and push button start. Three more trims follow the Sport, including the EX-L, the Touring, and the Elite. If you want the cream of the crop, top-of-the-line Elite, your model will start at around $43,680 and come equipped standard with ventilated front seats, a heated steering wheel, AWD, rain-sensing windshield wipers, mobile hotspot capability, Apple CarPlay and Android Auto connectivity, a hands-free power tailgate, wireless phone charger, and everything else you could find on any of the other models. The Honda Passport is an exciting addition to the Honda SUV line up. Come visit us at Valley Motor Honda and test drive one--we know you'll be as impressed as we are!